Lancashire, kings of the one-day competition back in the 90s haven’t reached a Lord’s final since 2006. 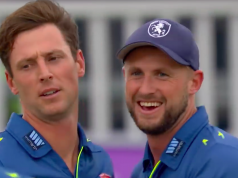 But they got their Royal London One-Day Cup campaign up and running with a mighty impressive win against a strong Warwickshire side, sparking confidence that their 50-over fortunes could improve this year. Jos Buttler was the undoubted star with the bat and his knock of 91 will deservedly grab the headlines, but it was only enough to get Lancashire to a very gettable target of 297. 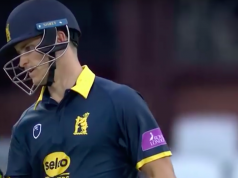 The Lightning bowled magnificently against a strong Warwickshire side, with Stephen Parry in particularly delivering an exceptional performance. Lancashire were once again sporting their quite frankly hideous RLODC kit. A debate was had as to whether, lime green, slime green, or pea green best described the attire, none of which carry favourable connotations. The Lightning’s key men stood up to be counted with the bat. Having won the toss and choosing to bat, their innings was spearheaded by Buttler. Playing in his first List A game for Lancashire, despite joining ahead of 2014, the England wicket-keeper showed all the class and flair that’s come to be expected of him against the white ball. 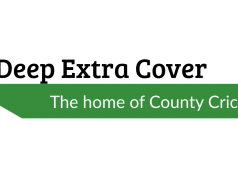 Several superbly-executed scoop shots off the Warwickshire seamers punctuated a brilliant innings of 91 from just 73 balls as he fell just short of a maiden county century in List A cricket. It was his highest limited-overs total for Lancashire and the innings came at a crucial time for the side. After a bright start with a 50-stand for the opening wicket between Martin Guptill and Alviro Petersen, three quick wickets left the Lightning stuttering somewhat on 88-3 when Buttler walked to the crease. Guptill’s own knock shouldn’t be overlooked. He made a super 56-ball half-century on his own List A debut for Lancashire – falling a ball after reaching the milestone. Buttler found support, initially from Liam Livingstone, but mainly from skipper Steven Croft with whom he shared a century stand from just 87 balls to guide Lancashire into a position of strength. Buttler was the dominant partner, hitting ten 4s and one 6 in his innings and when he was eventually bowled by an Oliver Hannon-Dalby slower ball, Lancashire were 240-5 and set up for a strong finish with 7.5 overs remaining. In truth it didn’t really happen for the Lightning after his departure. Croft passed his own half-century from 56 balls but fell in the final over for 67 as Warwickshire dragged things back nicely. From one stage where the hosts were eyeing up something in the region of 320-330, they finished on a total of 296-8 – which was generously deemed to be about par. And Warwickshire were going along nicely in pursuit of that total, at one stage looking like achieving it without breaking sweat. A 50-run opening stand between William Porterfield and Sam Hain got the innings off to a good start, but it was the third-wicket partnership between Jonathan Trott and Ian Bell that threatened to take the game away from Lancashire. When they came together, the score was 85-2 and the pair cruised past a 50 partnership in 52 balls. Trott also passed 9000 List A career runs in the course of his innings and the pair pushed the score on to 174-3 when Trott was brilliantly caught by Steven Croft off Parry for 66. The ending of that 89-run partnership was followed swiftly by the departure of Laurie Evans and the Bears began to toil. Between the 33rd and 43rd overs, they slipped from 163-2 to 198-5 as the hosts took control. And it was a control they never relinquished, continuing to take wickets before wrapping up a comprehensive 42-run win. Parry bowled beautifully, finishing with 3-43 from his 10 overs – all those wickets magnificently caught by Croft. But there was support from other more inexperienced members of the attack. Nathan Buck claimed 2-53 on List A debut for Lancashire, while 19-year-old Saqib Mahmood bowled brilliantly on his own List A debut. Tom Smith claimed two wickets in the final over to finish on 3-45, capping off a great all-round display in the field. Lancashire have previously reached Lord’s finals in 1976, 1986, 1996 and 2006, perhaps providing an omen that this could be their year once again. Parry was delighted with Lancashire’s performance and is hopeful the side can push on to have a successful competition. “It was great to start a fresh competition with a win, having not started too well in the T20s,” Parry said. “The main thing is that we have got a win against a good side, they’re as a good a one day side as we’ve played against for a while. “It was a great performance. We really squeezed and got the rate up with the ball which made it tough for them at the end.